All shows taking place in 2019 have been moved from Halle 7, Gundeldingerfeld to Atlantis. All purchased tickets remain valid. 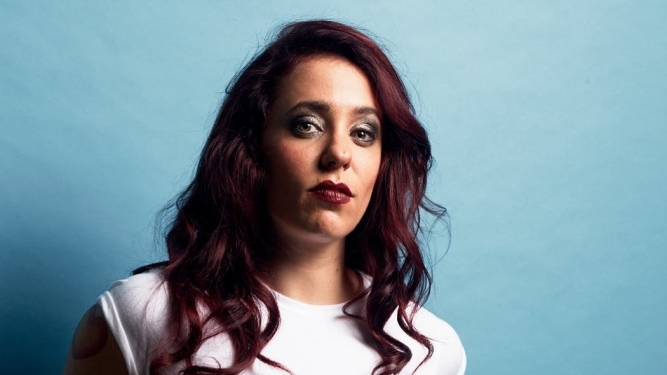 Founding member, lead singer, and bass player of the Kansas City blues-rock band, Trampled Under Foot, Danielle Nicole stepped out on her own in 2015 with her debut album "Wolf Den." In 2018, Nicole returns with the follow-up release, "Cry No More", on Concord Records. With through-the-roof emotional vocals, "Cry No More" is no ordinary blues-roots album with an R&B twist. Its rootsy with a musical edge and some of the best vocals to be heard in a very long time. "Cry No More" is a standout album with exquisite musicianship by Nicole, her band, and a cast of all-star guest musicians. Danielle Nicole is superb. What a voice, what a band, what great songs. You have to hear her to believe it. After leaving her family band, Trampled Underfoot, she fast became a headlining artist. Her debut album, "Wolf Den", proved that she could hold her own and then some. She was the first woman to win The Blues Foundation's 2014 Blues Music Award for 'Best Instrumentalist-Bass'. "I grew up playing the blues, and the blues is still a big part of what I do. But now I'm reaching out more and trying different things. It still sounds like me, but I'm stretching out a lot more than I have previously. ", Nicole explains. Nicole's distinctive, inventive bass work, which resulted in her becoming the first woman to win the Blues Foundation's 2014 Blues Music Award for 'Best Instrumentalist-Bass', is the product of years of intensive roadwork. Although she had no experience with the instrument when she became Trampled Under Foot's bassist, now she can't imagine life without it. "When I started doing my solo thing, someone asked me if I was gonna hire a bass player. No, of course not! ; "she continues." "I originally picked up the bass to keep Trampled Under Foot a family band, but I really fell in love with it. It was a huge challenge, and it still is. But I really love being part of the groove and getting to sing on top of that. I had learned some stuff on acoustic guitar before I started playing bass, but I never really felt connected to it the way I do with the bass. It's empowering, walking onto a stage full of grown men who can play their asses off, and it's OK, I'm gonna play this bass, we're gonna do this, and it's gonna rock." Wheel chairs: Wheelchair users need a regular ticket, the location is wheelchair-friendly.